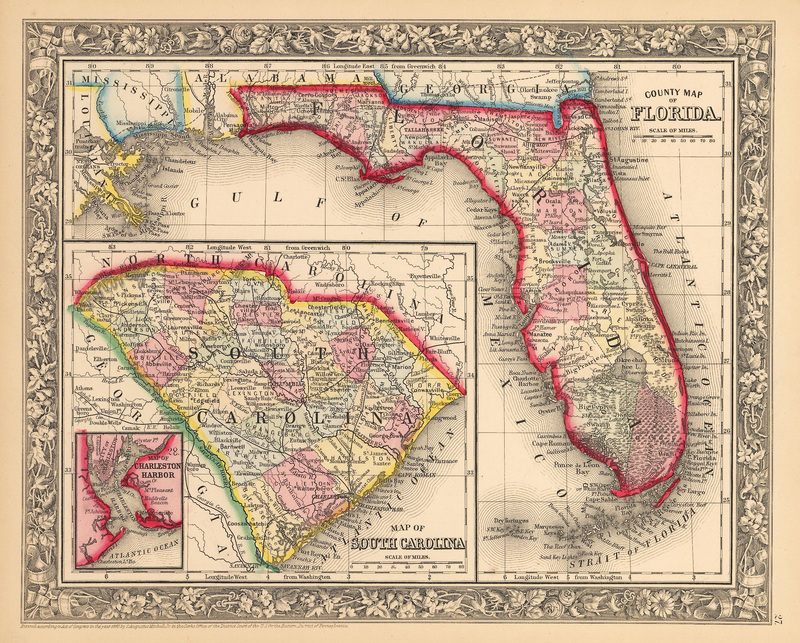 This is an authentic, antique lithograph map of Florida and South Carolina by Samuel Augustus Mitchell Jr. The map was published in Philadelphia as part of Mitchell's New General Atlas of 1962. It is color coded by county and notes important transportation routes, towns, and cities throughout. The Everglades and swamps are depicted to cover all of the Florida peninsula, south of Lake Okeechobee. Within the map of South Carolina is a small insert of Charleston Harbor. The map is surrounded by an elaborate floral boarder that distinguished Mitchell’s works from other map makers of his era.